Jennifer Skiff knew the important role dogs had played in her life emotionally and spiritually, she just wasn’t sure how many people agreed with her. 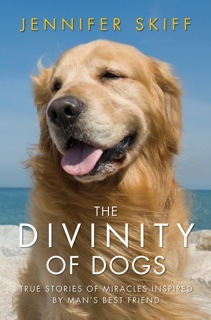 The author, who lives part of the year in Somesville, found out this month when her new book, “The Divinity of Dogs: True Stories of Miracles Inspired by Man’s Best Friend,” was released on Oct. 23. After three days, it was in its third printing. By Saturday, it was in the No. 1 spot on Amazon.com’s dog book list, No. 5 on the website’s personal growth and inspirational book list and No. 296 overall. The new book grew out of Skiff’s experience while collecting stories for her first book, “God Stories: Inspiring Encounters with the Divine,” published in 2008. Maine residents submitted 10 of the 100 stories included in that book. While editing it, she received many submissions that included stories about enlightening experiences people had with their dogs. Once Skiff, 50, thought about it, she realized her own dogs had taught her how to be a better person. “I am one of the people who have received the gift of emotional healing from a dog,” Skiff wrote in her book proposal. “When I was 7 years old, a retriever named Sally was my best friend, confidante and constant companion. She enthusiastically watched as I danced and sang along to David Cassidy records and rejoiced in our walks along the rocky coastline of Maine. We lived a happy life. Fourteen of the more than 70 stories in the new book were submitted by Mainers, Skiff said Saturday. For more than a year beginning in 2010, she collected information from and photos of people and their dogs on a website. Her instincts as a writer helped her figure out which submissions to follow up with interviews. Skiff wrote each of the stories herself but they are told from the point of view of the dog owners. Several were not easy to write, she said. In fact, the dog story of Freda Powell, the deaf mother of autistic twin sons, took weeks to complete. Powell and her sons were grieving the sudden loss of her oldest son at the age of 24 when Mazie, a yellow Labrador retriever, came into their lives. The service dog had been trained through a rehabilitation program at a Colorado prison for women. The book has a musical companion created with Florida composer and pianist titled, “The Divinity of Dogs: Music to Calm Dogs and the People Who Love Them,” that can be downloaded from Amazon and iTunes. Skiff said that she has donated music to shelters. The author also is donating 25 percent of after-tax profits from the book to charities that work to end animal abuse and promote sterilization. Skiff will wind up her book tour next month in Maine with signings at book stores in Portland, Damariscotta, Camden, Bucksport and Bar Harbor. For times, dates and locations, visit http://authors.simonandschuster.com/Jennifer-Skiff/78191544.